Although teeth position and shape are among the most important parts of dental aesthetics, the colour of teeth also matters. 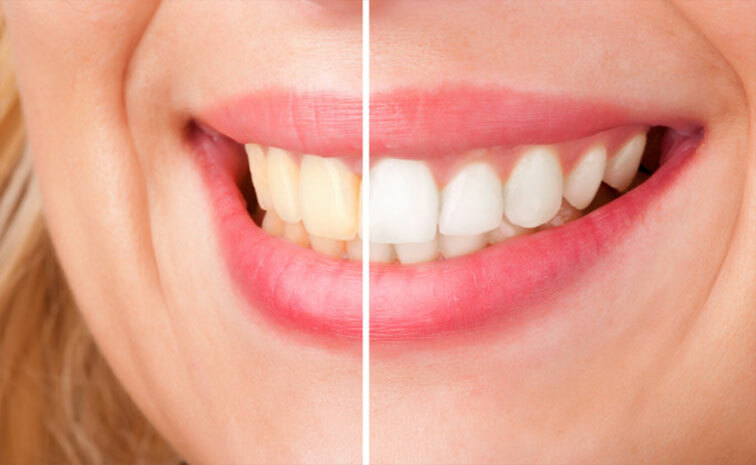 Human teeth’s colour naturally comes in various shades of light grey and yellow. However, elements such as the consumption of tobacco, drinks and foods combine to gradually alter the original colour of one’s teeth through the years. Since one’s smile often is a significant component of the first impression a person projects onto others, its brightness matters. Various options exist to modify and improve the colour of our patients’ teeth. Since we want to provide our patients with long-term results, only the best, evidence-based methods of teeth whitening are used at our clinic. This is why the treatment we recommend uses peroxide and combines in-clinic and at-home procedures: such a combination is more efficient and usually produces a steeper curb of bleaching. Our method basically consists of the daily application of a peroxide-based product through the use of a personalized mouthguard. The general length of the treatment varies between 10 and 21 days. The dentist first examines the patient’s mouth to see if he or she can realistically expect concrete results from a teeth whitening treatment. If this is the case, a customized mouthguard will be produced at a dental laboratory and a first one-hour, in-clinic bleaching session will take place. After that, the patient will be given an individualized tray containing all of the necessary materials to perform daily, at-home bleaching treatments for a predetermined period of time. Although results can vary from one patient to another for mixed reasons, the change is usually substantial and measurable with the help of a detailed colour scale.